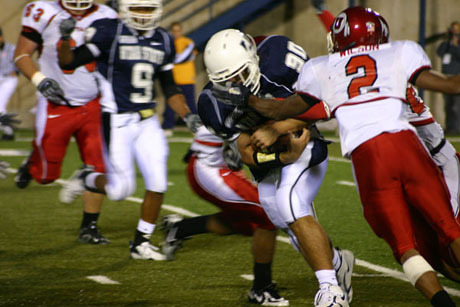 September 17, 2006 | The Aggies went down hard to the Utes on Saturday in their second shut-out defeat of the season. 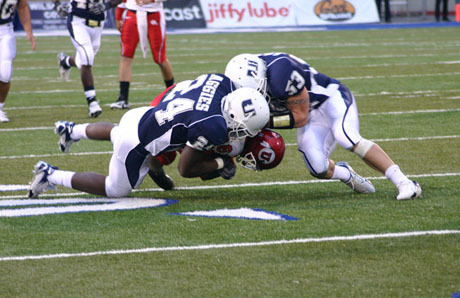 The University of Utah beat the Utah State 48-0, making the Aggies 0-3 and yet to score an offensive touchdown. It was all over after the second snap from scrimmage when Aggie quarterback Leon Jackson threw an interception to Utah defensive back Eric Shyne, who ran it 21 yards for a touchdown only seconds into play. Then after a quick four downs, the Aggies punted and the Utes returned with a field goal. The first quarter ended 17-0 in favor of Utah. It was a steady climb for the University of Utah after that, with the Aggies' only first-and-goal count coming with 7:26 left in the half and ending with a fumble by tailback Marcus Cross that was recovered by Utah. The Utes scored again, and ended the half up by 24 points. In the third quarter, Jackson was replaced with backup quarterback Bryan Black. But the change did little to help the Aggies. Black completed two of three passes, but fumbled once. Black was replaced with Mike Affleck, who didn't complete either of his two passes. The Utes scored two more touchdowns in the third and a touchdown and a field goal in the fourth, rounding out the Aggie defeat at 48. Utah State had six turnovers -- two interceptions by Jackson and several fumbles -- and had only 98 offensive yards, 39 of which were attributed to Jackson's four completed passes in 15 attempts. The Utes had 401 yards offensively. USU students and fans answered Coach Guy's pleas from the previous weeks to support the team with a nearly full student section at the game's start. But the Aggie fight song was heard very little from Romney Stadium, being nearly drowned out by the concourses of Utah fans' cheering and singing the Utah fight song. Ute fans had their own cheering section in the stadium; the northeastern corner was painted red with University of Utah pride, and erupted with every USU turnover and every U of U touchdown. By the beginning of the fourth quarter, the Aggie cheering section was in a state of evacuation, leaving the student section of Romney Stadium splotchy at best. Utah State will play Saturday in Provo against BYU. The Aggies' next home game is Sept. 30 at 1:05 pm.